South Africa midfielder Ayande Patosi may have missed his flight to join with his team in Cape Town before their flight to Sudan – and will thus miss the clash – but his team-mates will have to be steady on their toes in the fervour of Omdurman. Faced with the humid conditions that can subdue teams to play well below their optimum levels, South Africa’s task has been made even more arduous by the absence of their goalkeeper-playmaker Itumeleng Khune due to a foot injury. In what will be the first ever meeting between two of the founding members of CAF, the contest also marks coach Ephraim “Shakes” Mashaba’s first game of his second stint as South Africa coach. After bigger, highly qualified, peripatetic foreign coaches such as Carlos Queiroz and Stephen Keshi were touted for the national team job, the South African FA triggered suggestions from observers that they opted for the 64 year old because he was the “cheapest” option. That suggestion has prompted fury from Mashaba, a man with more than two decades worth of coaching experience. Much of that experience was gathered on the conveyor belt – at least in theory – of the South Africa national team: the U-17, U-20 and U-23 teams, with two different stints for the latter team. 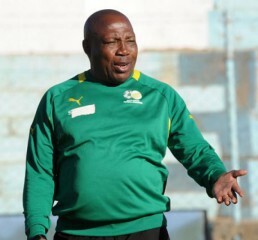 With the Bafana Bafana still navigating through the mud of perpetual transition phases, it is the familiarity of youth which Mashaba has, in line with federation’s vision of building a team for the year 2022, opted to mount his latest rebuilding effort from. Only one player in the 24-man squad is over 26 years of age. The trio of Rivaldo Coetzee, 17, Ayabulela Magqwaka, 18, and Nhlakanipho Ntuli, 18, are the youngest members in the squad. What’s more, sixteen of the 24 players named in the squad were not in the last squad Gordon Igesund named back in May for the tri-nations buddies’ friendlies against Australia and New Zealand.Thulani Serero, deemed the future of South African football and superb last season for Ajax, is the most high profile victim, supposedly as punishment for poor commitment. Other notable absentees include Siphiwe Tshabalala, (after his opening goal at the 2010 World Cup finally expiring, Siyabonga Sangweni, Reneilwe Letsholonyane and Tsepo Masilela. For their part, Sudan’s coach Mohamed Abdallah has promised his players will die a little on the pitch. After an encouraging outing at the 2012 Africa Cup of Nations, the Falcons of Jediane haven’t matched the strides in a country that probably has Africa’s highest attendances for domestic football. Last weekend’s 3-1 defeat away to Zambia caused further alarm about their backward steps in the last two years, but Abdallah believes they will make amends in the excessive evening heat in front of their home fans. The Bafana Bafana are no strangers into heading into such clashes billed as favourites. Their mixture of a relatively well-run professional league and European-like professionalism makes them infinitely more refined than the majority of the teams on the continent, but it hasn’t stopped them being on the wrong end of results. With most of the squad marching into uncharted territory, anything could happen on Friday evening.